In what was widely considered to be a rebuilding year for the Dawgs, they met and perhaps exceeded many people’s expectations. Yes, the way the season ended against Alabama was disappointing given the fact UGA essentially dominated the best team in the nation for 3 quarters. However, it was another learning lesson and a building block for this program and Kirby Smart. It is clear the gap is closing between Alabama and UGA and for the Dawgs to finally knock Alabama of their pedestal it will be a busy next 9 months. For the first time in his tenure as head football coach, Kirby Smart has to replace a coordinator. This is a critical hire for the program to continue its momentum on the field and on the recruiting trail. An in-house hire might be ideal but Coach Smart is likely to have a number of highly impressive resumes come across his desk this week. With the early National Signing Day December 19th – 21st, the Dawgs need to have someone in place in the next 10 days to hit the recruiting trail and reassure top targets. Current inside linebacker coach Glenn Schumann may prove to be the ideal fit, and with his youth, provide stability similar to what Kirby Smart gave Nick Saban during his eight year tenure in Tuscaloosa. The Dawgs have a number of draft eligible underclassmen with interesting decisions to be made. With the deadline of January 15th we will likely begin learning decisions soon. The names headlining the group are Riley Ridley, Isaac Nauta, Mecole Hardman, Elijah Holyfield, Tyler Clark and J.R. Reed. None are likely to be 1st Round picks, however each would likely be drafted, and some may simply be ready to get the clock started and profit on their talent. Those most likely to depart Athens appear to be Ridley, Nauta and Holyfied. Not since the days of A.J. Green have the Bulldogs had a true #1 wide receiver who can take over a game on the perimeter at will. Given Jeremiah Holloman’s elite physical tools, relentless work ethic and undeniable chemistry with Jake Fromm expect Holloman to break out in a major way in 2019. His physicality and speed make him a nightmare matchup for opposing defensive backs. Also, look for Demetris Robertson to bounce back in a major way. The former five-star recruit has too much talent and speed to be a non-factor. While he may have been forgotten due to his lack of impact in 2019 he should become a household name in 2019. The blessing in disguise for all of the injuries the Dawgs sustained along the offensive line in 2018 true freshmen Cade Mays and Trey Hill received substantial playing time and proved to be more than capable of playing at a high level. Jamaree Salyer is also poised to push for a major role. With a rotation of Thomas, Wilson, Cleveland, Kindley, Mays, Hill and Salyer the Dawgs have the most talented offensive line in the country. The expectations for this unit in 2019 are simple – dominate every week. Prior to tearing his ACL during his senior season at Scotland County HS, Zamir White was the best high school running back this writer had ever seen. His combination of size, speed, strength, elusiveness and vision were out of this world. His recovery was progressing tremendously and then lightning struck and he tore the ACL in his other knee on August 18th. Spring practice will begin around the 7-month mark of his recovery so he will likely be a limited participant as Georgia will likely be cautious with his recovery. As fall practice begins the Dawgs can begin to ramp up his activity with the goal of having him at 100% when the meat of the SEC slate starts after the bye week prior to the Dawgs trip to Knoxville. That gives Zamir nearly 14 months of recovery time. It obviously different than the situation with Nick Chubb’’s injury but Zamir has the same type of work ethic and if anyone can bounce back and regain his previous form it is the man they call Zeus. The loss of Deandre Walker will sting, but as the season progressed the Dawgs flashed pass rushing potential. Robert Beal, Adam Anderson, Brenton Cox and Malik Herring showed promise off the edge with Channing Tindall flashing a knack for getting after the quarterback from his middle linebacker position. The philosophy for Kirby Smart and staff has always been to “stop the run on the way to the quarterback” but against Alabama we saw the Dawgs aggressively attack the quarterback. Sure it allowed Alabama to break a few big runs in the 1st Half but the Dawgs affected the quarterback more effectively than they had all season. 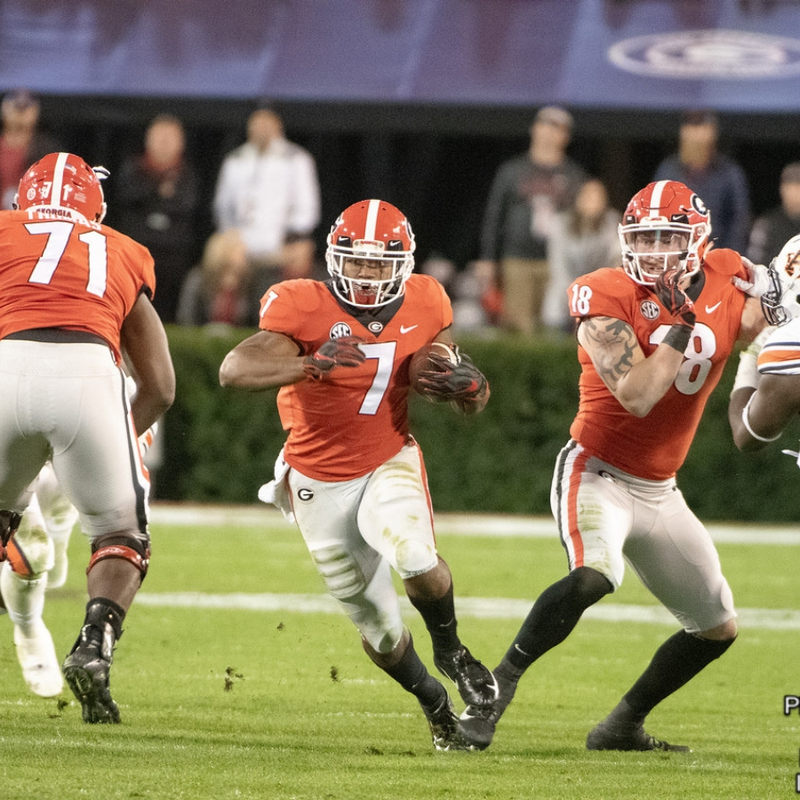 The emphasis in Athens will always be on running the ball and stopping the run but it will be intriguing to see how aggressively the Dawgs come after the quarterback in 2019. In 2018, the balance between Fromm and Fields was a point of contention for the fan base and in an honest moment Jim Chaney and Kirby Smart would likely admit they did not handle it well. They struggled with the rotation and appeared to lack a clear plan. The Dawgs now have a full off-season to evaluate how they handled the rotation and will undoubtedly execute better. After Fromm’s performance in the SEC Championship it is undoubtedly his team heading into 2019 but a significant role exists for Fields. He is certainly a weapon in the red zone and with increased comfort with the playbook should get at least two full possessions a game. If the coaching staff finds the right balance and Fromm and Fields both play to their potential the UGA offense will be a nightmare for the opposition. On paper, the Class of 2018 was the best assembled in UGA football history. It could eventually be the winningest class in the history of Georgia football and be the core group that finally pushes the Dawgs over the top against Alabama. Typically, college players make their biggest jump between year 1 and year 2, thus the progression of this class over the offseason will go a long way in determining how successful the Dawgs will be on the field in 2019. Two players who did not make an impact this season whose development will be particularly interesting to watch is Tommy Bush and Divaad Wilson because each have elite physical tools to be dominant players at their position. The Dawgs have a very good recruiting class on paper right now but the Dawgs need to finish strong over the coming months. They simply can’t afford to lose a Nolan Smith to Alabama and need to land a few guys like Jadon Haselwood, Nakobe Dean, Clay Webb, Tyrique Stevenson, Noah Cain, Trevor Keegan and/or maybe pull of a surprise flip or two. Last Saturday, we saw that the Dawgs are narrowing the talent gap with Alabama but in order to continue to narrow that gap you simply can’t miss on your top targets. With Kirby & Co.’s relentless work ethic on the recruiting trail you have to like the odds of the Dawgs finishing strong. There is no doubt that the message for Coach Smart to the team after the loss to Alabama is “the 2019 season begins today”. Every lift, every rep in practice, every snap in the Sugar Bowl against Texas sets the tone for next season. A dominant performance by the Dawgs against a solid opponent could set the stage for an Alabama and UGA to be #1 and #2 respectively in next seasons preseason polls. Yes, technically those polls mean nothing, but at the end of the day perception means a great deal and gives the program momentum on the recruiting trail and a larger margin of error in the ultimate goal of reaching the playoffs. Matthew “Huck” Pasek was born into a family of Georgia Bulldogs. Huck’s father, Gary, graduated from UGA in 1976 and became a high school chemistry teacher at Peachtree HS in Dunwoody, GA where he coached alongside Georgia High School football legend T. McFerrrin. Gary’s love of football, especially Georgia football, was passed along to his son. Huck lives in Belmont, NC with his wife, Whitney, and works in Financial Services Litigation. In his spare time he is an avid golfer, movie fanatic and habitual traveler to St. Simons Island with his wife “just to get away”. The moniker ImYourHuckleberry arose from his favorite movie, Tombstone, and character Doc Holiday’s famous line, “I’m Your Huckleberry”. Matthew was never one to shy away from a confrontation or debate, thus the nickname instantly stuck.